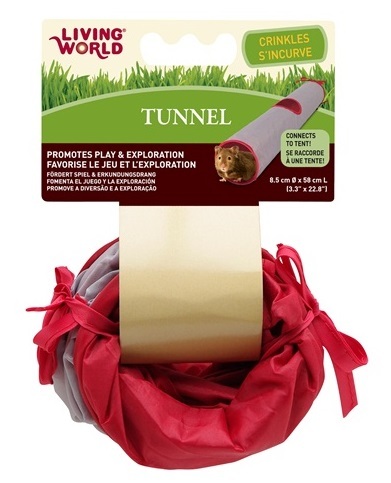 Living World Small Tunnel (Small) is specially designed to attach to a Living World Small Tent for small pets (HG 61385). The Tunnel provides small animals with extra space for play and exploration. The Tunnel may also be used as stand-alone play area to simulate tunneling and burrowing. Constructed of polyester fabric that makes a crinkly sound for added fun. For indoor or outdoor use (includes corner ties to secure to the ground). Small size is suitable for hamsters, gerbils, mice and rats. Color: Grey/Red.